Falmouth Flag Day 5k Run/Walk, June 9, 2013, 10 a.m.
Jeremy Raber outsprints Teaticket Elementary School teacher Julie Duffany. Jeremy was first in his age group, 10-13. Mrs. Duffany is a Falmouth Education Foundation grant recipient in addition to being a speedy runner! Bang! The gun goes off. My heart springs into action. The whole time I am trying to catch my last breath, until the end. Finally it’s over. I won my age group. 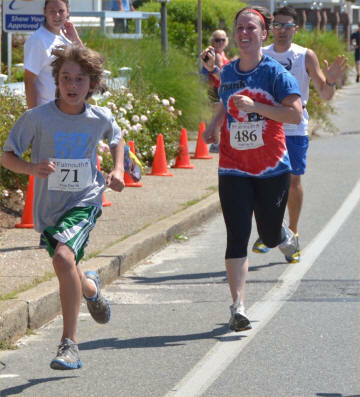 The Falmouth Flag Day 5K has seen its new winner of the 10-13 age-group. This time I won. Boy, did I feel great when I crossed the finish line! I felt like I could do it again. The Falmouth Flag Day 5K is a 3.1 mile race that is held the weekend before Flag Day during the month of June. The race starts and ends at The British Beer Company, across from the Falmouth Heights Beach. The race has no age limits and no time limits. If you win in your age group you win a prize. To win first place in my age group, I had to push myself to my limits, start strong and end stronger. I ran an average of 7:18 per mile (22:40 for the 3.1 miles), which I need to work on for the next race. One of the participants was a teacher from Teaticket Elementary who was behind me the whole time: one mile, two miles and three miles! I could hear her footsteps getting closer and closer but I pulled ahead of her and beat her. I felt proud of myself at the end of this race. I worked on my endurance, my motivation and my will power. I am the only member in the Raber family that runs! I can’t wait for the next race!